UV radiometer for real time intensity monitoring. Easily portable, hand held operation · Large LCD display. The PM600 UV intensity meter is used to monitor and measure high intensity UV energy using a hand held meter and attached probes. For use with the meter, there are two types of probes available. Our 9 inch probe can be used to reach UV medium pressure lamps that are typically over a conveyor. This probe is designed to withstand high thermal temperatures up to 500 deg. F. and to fit into places difficult to reach. The other probe that can be used with the meter is our SCU probe. is used for monitoring a SCU spot curing system. The SCU probes attach to the end of a UV spot curing wand, and allows companies to monitor and adjust UV output on SCU type systems. The PM600 probes are designed with a narrow bandpass filter, giving a 365nm peak and a 20 nm half width spectral response. Probe cable length are normally: 36-inches in length. Calibration accuracy is +5% tolerance (deviation of working standard to primary standard). The meter has a ON-OFF switch and a Indicators: 3.5 digit LCD. Power Source is a standard 9 VDC battery. 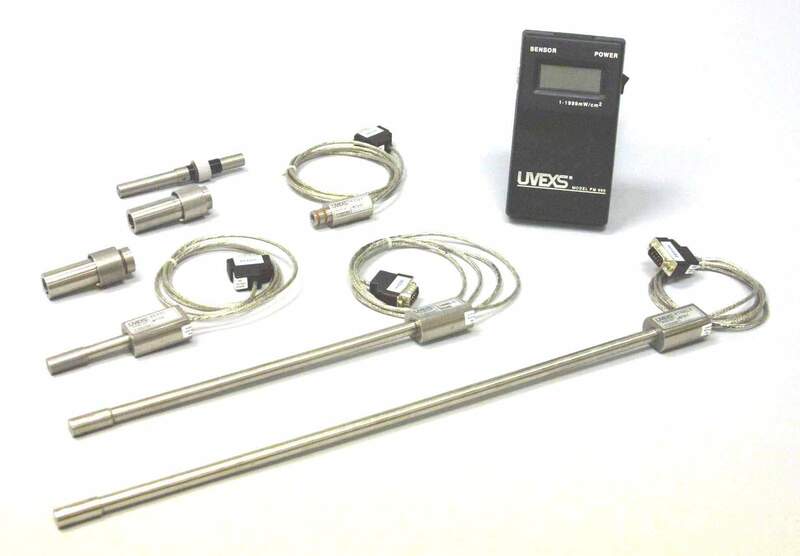 UVEXS calibrates these meters and gives a Certification which is NIST traceable. We recommend a 6-month recalibration interval. When ordering, specify the PM 600 meter with specific probe(s) desired. Meter and probes are factory calibrated prior to shipment. Meter and probe combine to form a measurement system. For systems using more than one probe, we calibrate each probe to the meter.